Early Central Park Guidebook hot off the electronic press! 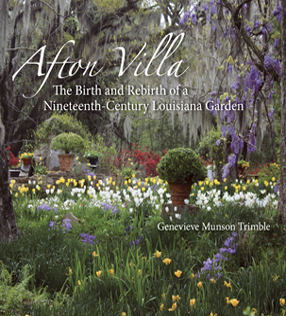 This handsomely illustrated book is a history and memoir by Afton Villa’s owner, Genevieve Munson Trimble, a former Foundation for Landscape Studies Place Maker honoree. Trimble’s remarkable story begins with a tragedy. In 1963, fire ravaged the forty-room Victorian Gothic plantation home known as Afton Villa, reducing to ashes more than 170 years of history. Soon after it was abandoned, the villa’s carefully laid out garden beds became overgrown with weeds, while rampant vines smothered the twin rows of azaleas lining its serpentine entrance drive. Limning a portrait of the past as well as a picture of the present, Trimble provides a history of the original owners before recounting the bold decision she and her husband, Bud, made to purchase and resurrect the ruined mansion and its surrounding gardens. In her intimate and loving account of this decades-long restoration project, she demonstrates the way in which creative conservation of the spirit of a place surpasses mere historic preservation of a period artifact.